This is my first year at The Coachella music festival held in the desert of Indio California, right outside of Palm Springs. Everyone told me the weather was going to be HOT HOT HOT. Turns out they were lying :) It was FREEZING, and I'm from Chicago, so that statement should mean something. It was sort of sad to see all the pretty young things running around in their pre-planned Coachella fringed half shirts and short shorts, shivering and looking fairly miserable. This lovely lady however, obviously checked weather.com before stepping out and looks RAD in this leopard print coat. Nicely done. 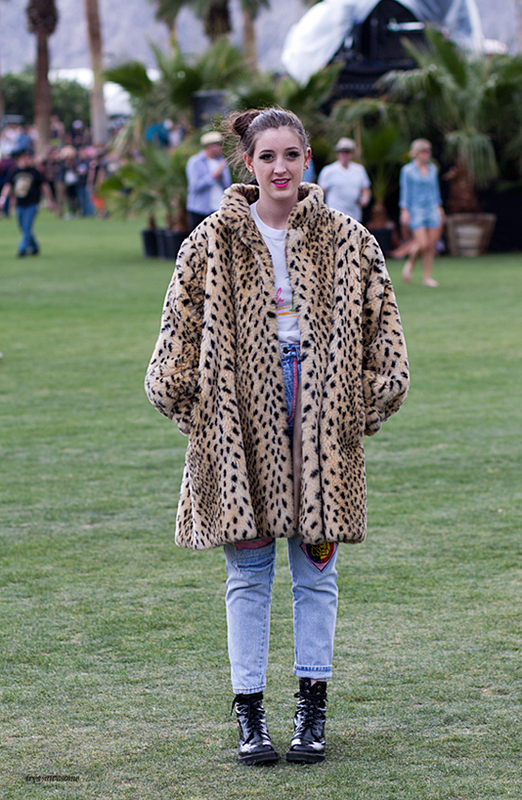 So unusual to see a coat at Coachella! She looks great. Any other street styles from Coachella? !